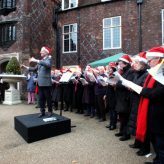 Join the Friends of Fulham Palace for their popular annual Carols by Candlelight in our beautiful Tudor Courtyard. The Addison Singers will be singing well-loved festive songs and committee members will be selling mince pies, mulled wine and hot chocolate. Free, click here to register.